AI-DAY is actually a two-day event of talks, demonstrations, panel discussions, and networking. It brings together international experts, industry leaders, academics, and local trailblazers to showcase prolific advancements in AI – and how they’re changing the world. Andrew Smith: Head of Strategic Partnerships, board member of the AI Forum, and part of the working group: Adapting to AI effects on law, ethics and society. Matt Bilson: Technical Director & Strategist. Last year’s AI-DAY focused on the promise, potential and opportunities for AI to solve problems and drive change for good. 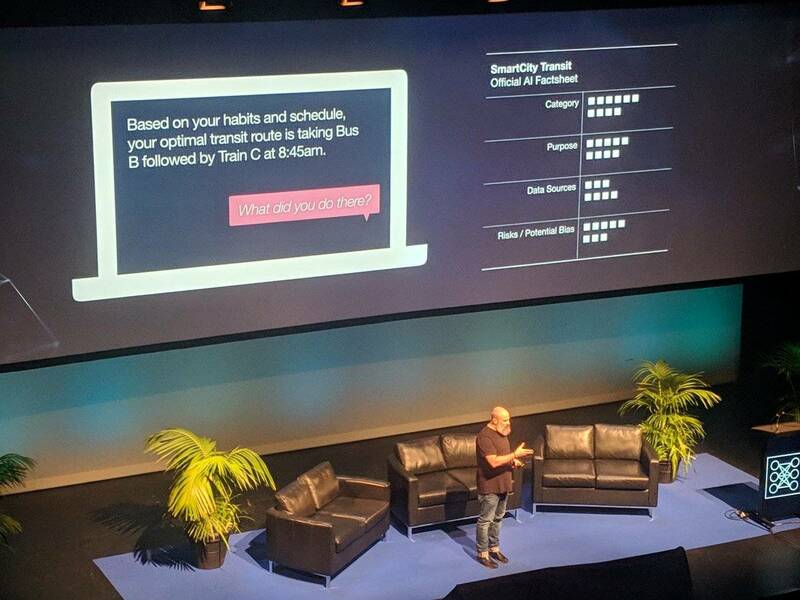 At this year’s event, speakers from New Zealand and abroad presented some real-world applications of AI. They shared a common call to action for establishing ethics, laws, and regulations around building trust in AI’s potential for positive social impact. Real-time translation, enhancing productivity, and ethical principles. iFlyTek, the third-largest AI company in China, gave a demonstration of their real-time language translation technology. As they spoke about their technologies and applying them throughout China, their words were transcribed and translated from Mandarin to English on the screen behind them. The impressive software would even recognise (and remove) all the “um’s”, “ah’s”, and “hmm’s”. In the keynote to kick off session two, Aware Group CEO Brandon Hutcheson discussed the use of AI to enhance productivity for mundane tasks. Brandon used the example of Aware Group’s technology that uses computer vision to take attendance of children in schools. One potential drawback he raised was the loss of interaction between a student and a teacher. Taking away a roll call in classrooms – even though it’s a small interaction – could be taking away one of the few opportunities for a student to engage in speaking publicly or connecting with their teacher. Adam Cutler, head of design at IBM took us through the ethical principles that IBM have developed for AI. He stressed the importance of ‘doing the right thing’, rather than focusing on compliance with laws and regulations when developing these principles. Adam discussed the considerations AI organisations should take to form their own set of principles. 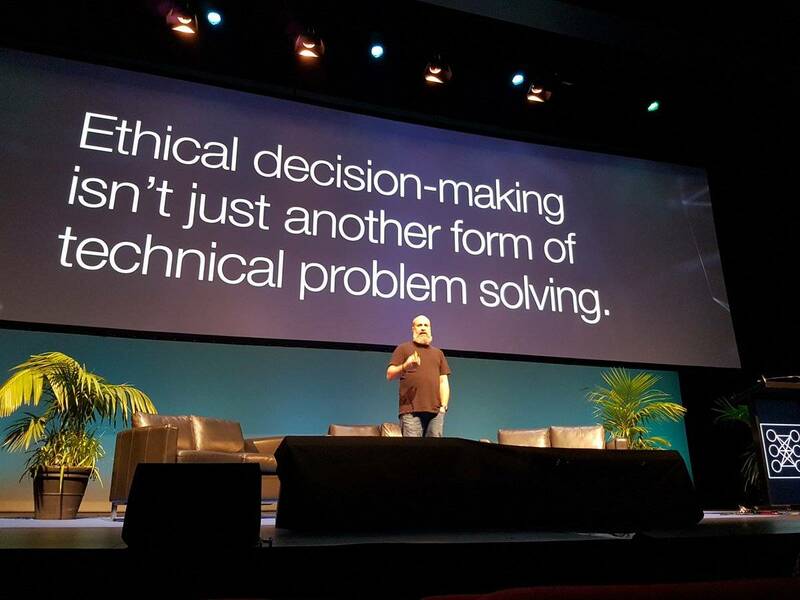 A recurring theme of AI-DAY – and particularly in this presentation – was the need for emerging technologies to take ethics into consideration, and how the technology will be used ethically. Optimising healthcare, establishing new laws, and a return to trusted journalism. Microsoft’s David Heiner explored the varying laws, ethics, and values from around the world when deploying AI across international borders. If we’re building tech that can behave like a human, how might we assign laws, ethics, and values when these are so varied around the world? Precision Driven Health’s Dr. Kevin Ross talked about mitigating the wasted expenses associated with the current health system. He presented that healthcare is becoming unaffordable, yet around one third of healthcare spend is wasted. Unnecessary services, excess administration costs, inefficient care delivery, and failures to take more preventative measures were some of the key areas of wasted spend. In the US, an average of around $3000 is spent on wasted healthcare per person. Using data science, Precision Driven Health is finding efficiencies – making sure people get access to the right treatment, the first time. Dr. Mahsa Mohaghegh (AUT) raised the potential for robots to replace school teachers. Her verdict was that it won’t be a ‘replacement’ scenario, but more of a ‘symbiotic relationship’ between the two. A relationship where the robot could assist the teacher in answering questions and taking lessons, providing teachers more one-on-one time with students. The challenge of creating an AI teacher is designing it to be able to foster strong connections with the class. That includes elements of personality, inspiration, and encouragement. Partner at Hudson Gavin Martin, Anchali Anandanayagam discussed the legal challenges of AI. She notes that our current laws are built on crimes being committed by humans, and all of our rights are established for humans and human interaction. In the future, this will not be the case. What if crimes are committed by robots? Anchali echoes the calls for focusing on the establishment of new laws and ethical principles that consider AI’s interactions with society. The final talk was a keynote delivered by Sean Gourley – founder and CEO of Primer. Sean gave a rundown of a selection of powerful, yet worrying AI technologies. Machines now have the power to generate completely unique and flawless written content, videos, and images. The generation of false information that is indistinguishable from reality poses a major threat to society. Manipulation of information and its calculated distribution can be presented to change moods, sway opinions, and provide false content that appears to be real. Sean brought up some of the recent cases of AI being used to create negative outcomes through social media. ‘Troll farms’ in Russia have created divisive material, and the outcomes of Brexit and the US presidential election have been influenced by these troll farms. Read Sean Gourley’s full piece on ‘the endless slurry of fake news'. Speaking with attendees and attending the talks, the general conversation throughout the day was often centred around the ethics of AI – particularly in journalism. Speakers recognised the risk of emerging technologies following the same negative path we’re currently seeing with AI and social media. With the rise of fake news, data privacy issues, and reinforcement of malicious and antisocial behaviour. It’s possible we’ll see a further loss of control of this powerful tech, creating potentially disastrous outcomes. What excites us about AI is the ability to make sense of, and act upon, the massive amount of data we create. It’s potentially one of the ways we might find solutions to enormous and daunting problems like global warming. But there’s a concerning aspect too. It gives a huge amount of power and responsibility to the handful of tech giants we give our data to. As with any technology, there are great opportunities, but also great risks for AI. Our concern is that, like with social media, we don’t appreciate the risks until it’s too late. We're interested in harnessing the opportunities of AI for good. If you've got a project or idea to make this happen, we'd love to talk.